In case you haven't seen it yet: suits of armor for your pets. Artist Jeff de Boer has meticulously crafted protective ensembles for cats, and—to even the playing field—mice. He draws his ideas from different time periods and countries, including Edo period Japan and Medieval England. He's even made a futuristic rocket mouse. These marvelous suits are substantial works of art; the cat armor can take up to 200 hours to create. Boer first started making the suits while attending Alberta College of Art and Design. 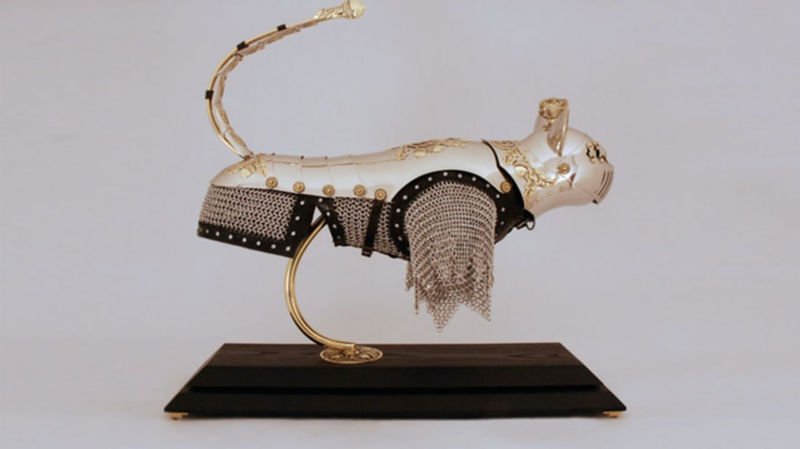 The artist had an extensive knowledge of armor, so he created a cat suit in his sculpture class. Feeling he could do better, Boer sought to make real armor. Thanks to his major in jewelry design, he had access to all the necessary tools. If you're looking to purchase one of these works, you will need a big wallet and a lot of patience. Boer does not frequently sell his work but when he does, it costs as much as $25,000. You can buy a book filled with his art here, or like his Facebook here.